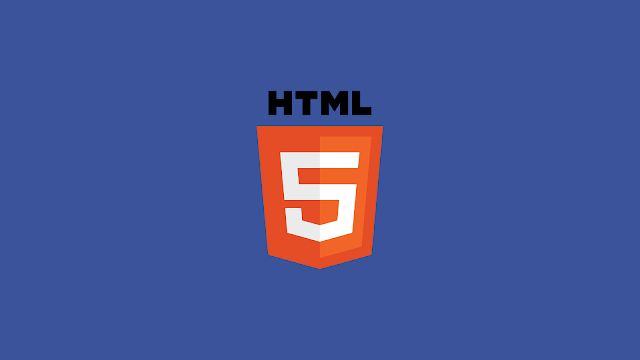 For HTML which covers Forms. 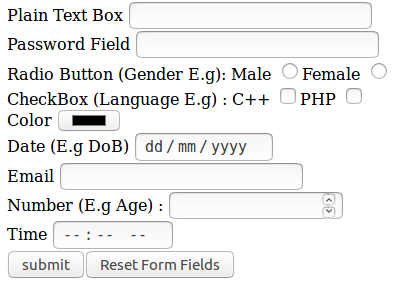 Form elements are such element which we used for creating our HTML form like Some Elements input box,dropdown select,Buttons,Textarea. Input Box – For Simple input of data in any format. textarea – For Large Area of Input Contents ,Description Message which is used to display our data in also multiline. Button – For Submit our Form or Simple Button For Any Events. From line <form> - Here is form beginning form elements pass all data to new page on submitting. Form elements pass only that data which is child element of form. method= method is default get but we can use get or post. action = action is our url for submitting data on that page like any server side page where it catch that data. 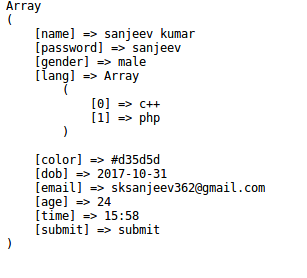 ( which we see in php tutorial) for now we just pass and server side language catch it. Other line after that are data elements which contain in its its variable and variable name is name=”value” this value is the variable name which we catch in server side. Submit = button submit is used to submit our its very important for submitting our forms. Here you two types of option i declare both is same but if we dont defined (set value=”value”) then option text value will be passed else value attribute value pass. 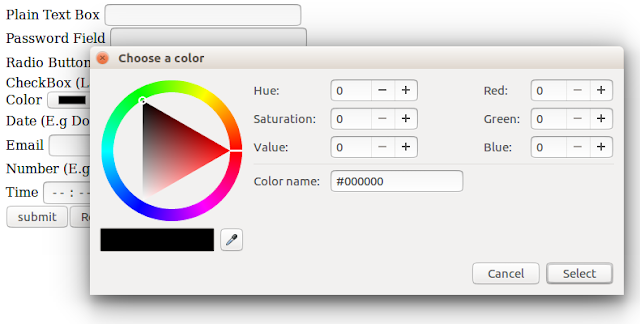 We can set the size of select box like display more than one value at a time by using. 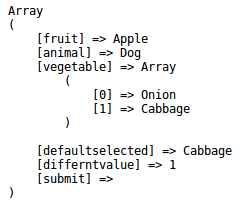 We can also make multiple selection this time the value will pass in array format. I Know You all Excited To Check This Form Data After Seeing Output So Jst Use this. Text area is a large area for writing contents like post,message it is multi line input area. 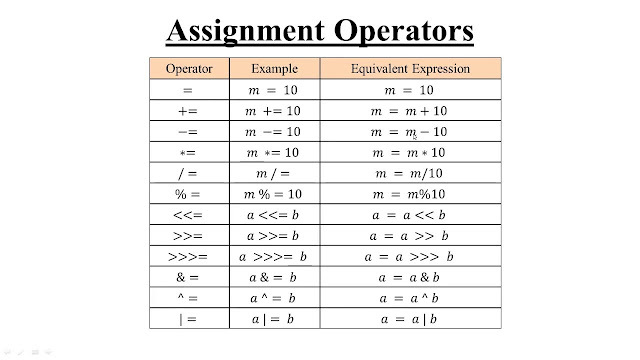 Input Elements is a huge list of types that why am covering this on last topic. 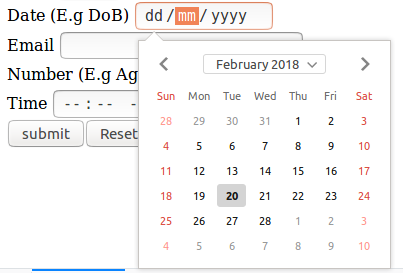 It contain datalist like auto complete data. Now We See Different Types Of Inputs Now lets see its Extra Attributes. value=”value” which set values in input fields. readonly=”readonly” which only reads values we can’t edit it. disabled=”disabled” disabled the input element then it will be not pass data to server. 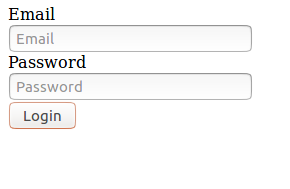 required=”required” used for validation without filling that field user can’t submit form. autofocus=”autofocus” which directly focus that field when page loads. yours blog provide good knowledge about web developmen.it will helpful for many of us thanks a lot for providing such a good information.